Unemployment is one of the biggest challenges in the Gulf Cooperation Council (GCC). Despite efforts undertaken by GCC governments to increase employment among nationals, analysis reveals that unemployment among local talent remains high. According to the Bayt.com Nationalization in the GCC poll, April 2015, 42.3% of GCC residents believe that local talent remains unemployed; another 24.6% think that finding and hiring local talent is difficult when compared to hiring expatriate talent. Although this problem has been somewhat curtailed due to the GCC’s provision of welfare that rely heavily on oil revenues, oil-dependent welfare is a source of income that will likely prove unsustainable in the long run. GCC policymakers need to shift more of their national talent away from welfare and government jobs and into fast-growing new industries outside of oil. With a young, educated population entering the labor force in large numbers each year, creating a sufficient number of well-paying jobs is a critical challenge to support sustained and inclusive growth in the GCC. But as national talent are still primarily attracted to jobs in the public sector -mainly due to higher wages and other benefits- policymakers and private companies will need to devise new strategies to attract and retain the new labor market entrants. The governments of many countries in the GCC have introduced localization policies for the private sector. According to a poll conducted by Bayt.com on How Successful Are Nationalization Efforts in the GCC?, May 2013, 52% of respondents say that their company has a firm policy for hiring nationals; half of them believe these policies are effective. localization policies stipulate what percentage of a company’s workforce should be local talent. Nitaqat, in particular, is a program designed by the Saudi Ministry of labor to boost the employment of nationals and fight unemployment. under the program, private firms are classified into Premium, Green, Yellow and Red categories, based on their percentage of Saudization. The program sets penalties and incentives for companies, based on the category they fall under. Companies with high Saudization rates will fall under the Premium or Green categories, while those who fail to achieve the required rates will be included in the Yellow and Red categories. Nitaqat ensures that Saudization rates are based on the actual performance of private businesses, and takes into consideration the sector as well as the size of workforce for each company. Apart from the Saudization of labor, the Nitaqat program also aims to fulfill other short-term and long-term objectives, such as facilitating the employment of women, specifying minimum wage, the protection of employee rights, etc. 1. UNDERSTAND THE LABOR LAW AND TRACK IT. It’s important that you have your ear close to the ground when it comes to governmental labor policies. Keep track of them through government websites as often as possible. 2. DEFINE YOUR COMPANY AND SET A CLEAR TALENT DEVELOPMENT PLAN. Before hiring, there are several things that are essential to ensuring that your hires are strategic. Start by defining your company mission, vision and goals, set a business development strategy, and put in place a talent development plan. These will help potential candidates understand the company background and assess whether they will be the right person for the job. There cannot be enough stressing on the importance of drafting clear job descriptions and requirements for candidates. This will help your recruiters get started on finding you the right candidates. 3. USE THE RIGHT RESOURCE TO FIND LOCAL TALENT. Online recruitment has revolutionized the recruitment landscape. according to the Bayt.com Recruitment Practices in Middle East and North Africa poll, May 2015, 89.3% of employers believe that their company’s recruitment would benefit from having a career site on their corporate website; 20.3% prefer posting vacancies on a website accessible to millions of people; and 12.5% say that engaging with specialists on professional networks is the preferred method. 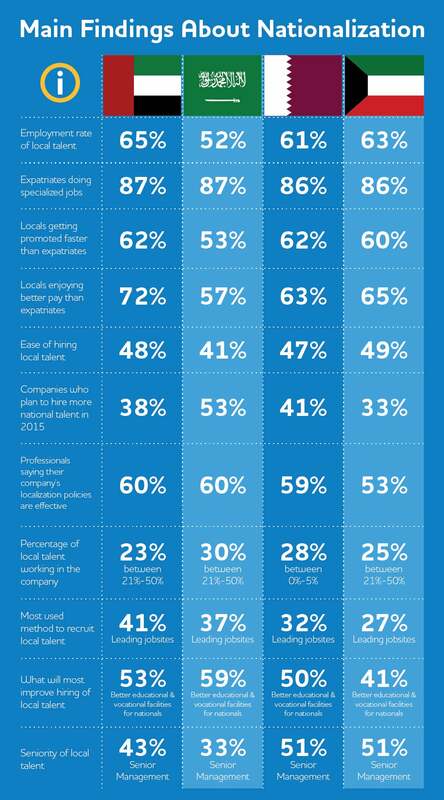 Only 4.8% say that using traditional recruitment companies is the easiest way to hire top talent in the region. 4. RETENTION OF TOP TALENT. Finally, once you have screened and hired the best local talent, you need to focus on staff retention. In order to emphasize on retention, company leaders need to work hard on communicating that their company is a good one to work with. Regular training programs, opportunities for employee recognition, and company activities can help keep morale high. GCC employers should also be aware of the salary scales in their industry, as well as the salaries offered in the public sector, to ensure that their compensation programs remain competitive. WHERE LOCAL TALENT IS, AND WHERE YOU NEED TO BE Traditionally, professionals in the GCC were recruited through headhunting agencies, newspaper ads or referrals. These methods have proved to be expensive and not very effective. Fortunately, the recruitment landscape is changing for the better. And where once online recruitment was used primarily to recruit entry-level and mid-level professionals, it is now a major platform to source and hire senior talent as well. In reality, GCC professionals and jobseekers these days are web-savvy and active internet users, and as an employer, you must realize that if you want to win in the recruitment arena and hire the best talents, you will have to move where those talents are and embrace online recruitment. Leading job sites, such as Bayt.com, serve as a highly effective online medium for posting jobs and finding the best recruits. Bayt.com has over 20.5 million job seekers registered on its website, ranging from interns and entry-level professionals to team leaders, middle managers and C-suites. 1. HIGH OPPORTUNITY COST. Today, there are more than 135 million individuals using the internet in the arab world (The Arab World Online, May 2014). Similarly, 51% of employers who took part in the Hiring Management in the MENA poll by Bayt.com, august 2012, say they hire senior executive talent online. with more than 20 million registered professionals, Bayt.com serves as a highly effective online intermediary for employers in the GCC and across the region. The sheer size of the Bayt.com database means that the opportunity cost of not being online is huge, specifically given the volume and momentum of recruitment activity that takes place on the website every day, at every end of the career spectrum and across all industries. 2. SENIOR TALENTS BELIEVE IN THE POWER OF WEB. 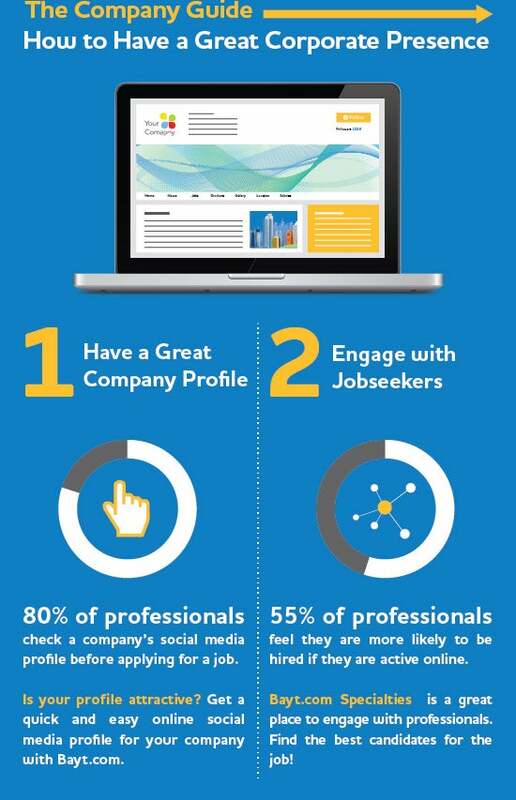 55% of professionals in the region feel they’re more likely to be hired if they are active online, as revealed in the Bayt.com Social Recruiting in the Middle East and North Africa poll, october 2014. Being online means the recruiter has a better idea of a candidate’s personality, achievements, knowledge and hands-on experience. In many cases, highly established executives have their own blogs and many of them are on social media. These online activities can assist companies in gauging potential candidates while simultaneously avoiding the costs of hiring the wrong person. evaluating their actual work will also prove to be an accurate assessment approach. Sourcing becomes easier as almost everyone becomes ‘findable’ on the internet. 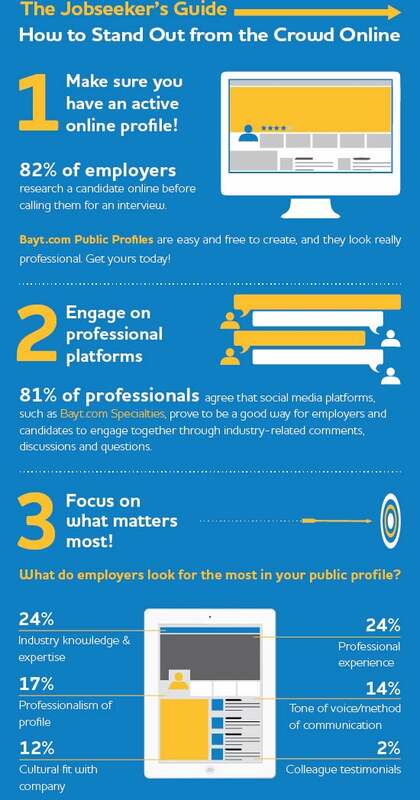 Bayt.com Public Profiles, for example, are a great way for employers to know more about a candidate, well beyond the limits of a traditional CV. 3. HR DEPARTMENTS ARE BUDGET-DRIVEN BY NATURE. Time is money, and today’s budget conscious HR departments are anxious to save both. The Bayt.com Skills and Hiring Trends in the MENA poll, January 2015, reveals that 48% of companies in the Mena region take quite a long time to fill an open vacancy in their company– between one and three months. The internet has emerged not only as a faster, easier and more effective way to source and screen top talent, but also as an efficient tool to manage the entire hiring process. with amazing technologies available in the market today, companies can search through millions of CVs and promptly narrow them down to the exact candidates required. The Bayt.com CV Search and Job Postings are only examples of the wellspring of services that help employers find the perfect match for their job vacancies. with the possibility to filter CVs using very specific criteria, such as years of experience, nationality, location and industry, the chances of finding the right candidate becomes much higher. 4. TOP EXECUTIVES ENGAGE IN DAILY ONLINE CONVERSATIONS. Professional networking forums are the new frontier in online recruitment and a top choice for identifying leaders in their area of expertise, especially at the senior end of the spectrum. 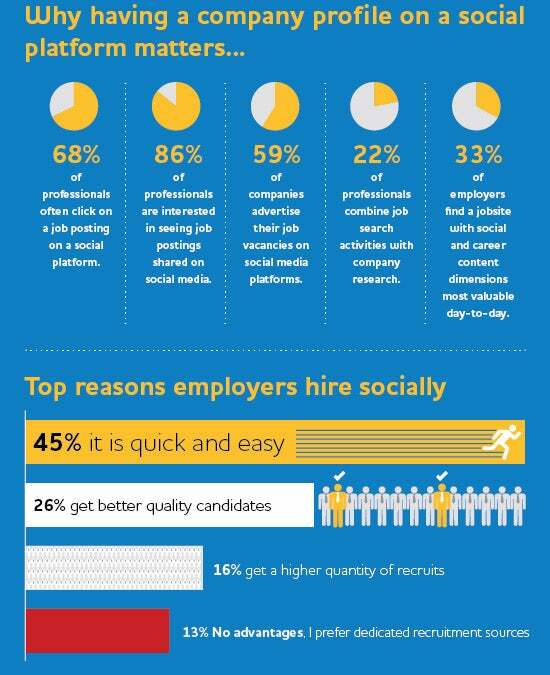 This could be attributed to the fact that 81% of professionals feel that online platforms, such as Bayt.com Specialties, are a good way for employers and candidates to engage together through industry-related comments, discussions and questions, according to the Bayt.com Social Recruiting in the Middle East and North Africa poll. Bayt.com Specialties invites specialists from all over the world to come together and engage in industry-related discussions. Specialists with the best content are endorsed by their peers and get badges and ranks on their Cv. The platform has proven to be a great tool for companies to pick the best among top executives in their industry. This indirect approach to hiring, which relies on networking and relationship building, is necessary to get to know a candidate before hiring them.